Retrieving Trial Champion Reveirter Snow Storm - Tug was born on 15 April 2004 and completed competitive trialling with Kate and Noel on 11 June 2007 at the German Shorthaired Pointer Club of South Australia Retrieving Trial at Mulgundawah. This was certainly not the end of Tug's trialling career and was passed on to a new home and handler to be campaigned by Bill Hepburn in Tasmania. From an early age Tug’s desire to please could not be questioned but his application got a little confused at times. Tug would always do his best to please it was just that the understanding of the communication broke down a little at times. 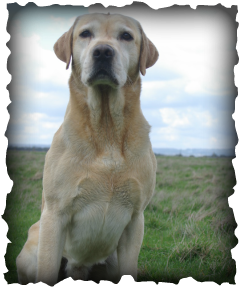 Tug’s trial career commenced on 5 June 2005 in a Central Highlands Working Gundog Beginners test conducted at Geelong. Tug won the test on that day. “Tugs” career in Novice was similarly short successful winning his way out of Novice after six Novice Stakes winning three and placing in two of the others. “Tug” won his third Novice Stake and gained his Novice Retrieving Dog title at an Irish Water Spaniel Club Trial conducted on 2 October 2005. Tug's career in Restricted were interspersed with a number of unsuccessful starts in All Age Stakes. Tug eventually won his way out of Restricted Stakes by winning an All Age Stake and his Restricted Retrieving Dog Title on 28 April 2007. Tug gained his Retrieving Trial Champion Title three trials later by winning an All Age at the Retrieving and Field Trial Club of South Australia Trial conducted at Meadows on 27 May 2007. Even though he won two All Age trials reasonably quickly “Tug” continued to worry about his trialling when handled by Noel. It was at this stage in his career and after competing in 34 trials for Kate and Noel that Tug was handed over to a good friend in Tasmania, Bill Hepburn to campaign in trials on 21 July 2007. This change of home and handler seemed to make Tug much more confident and over the next 20 starts over two and a half years “Tug” only failed to finish two trials at All Age and Championship level. Tug went on the win a further 8 All Age Stakes for Bill. He also placed in another 7 All Age Stakes and placed in two Tasmanian Retrieving Trial Championships included third in his last trial the 2009 Tasmanian Retrieving Trial Championship. Tug gained a total of 60 championship points in All Age Stakes in his short but successful career. Tug unfortunately contracted juvenile cataracts in both eyes that were fast sending him blind. Tug succumbed to the effects of this disease in early 2010 at the age of six without trialling again. As the breeders and initial campaigners of Tug we would sincerely like to thank Bill for his efforts in continuing Tugs trial career and enabling him to continue doing the activity he so dearly enjoyed doing.